In May 2016 the Geezers took part in an Active Energy Workshop at Three Mills. They worked with artist, Loraine Leeson, and engineer Toby Borland to construct a stream wheel. The wheel turns in water coming from the mill. It powers an aerator to help oxygenate the water and counteract the effects of pollution on the river’s fish and wildlife. In December 2016 The Active Energy project received the Best Arts and Green Energy award from RegenSW. Active Energy is a collaboration involving members of The Geezers Club with artist Loraine Leeson and engineer Toby Borland in the development of technologies to improve their lives. Active Energy was launched 12 years ago. Loraine Leeson asked the Geezers which technologies they would choose to support themselves and their community. The Geezers chose tidal power. Some of the Geezers fished in the Lea when they were boys. The Lea has been quite polluted. The Saxons used waterwheels at Three Mills to make flour. 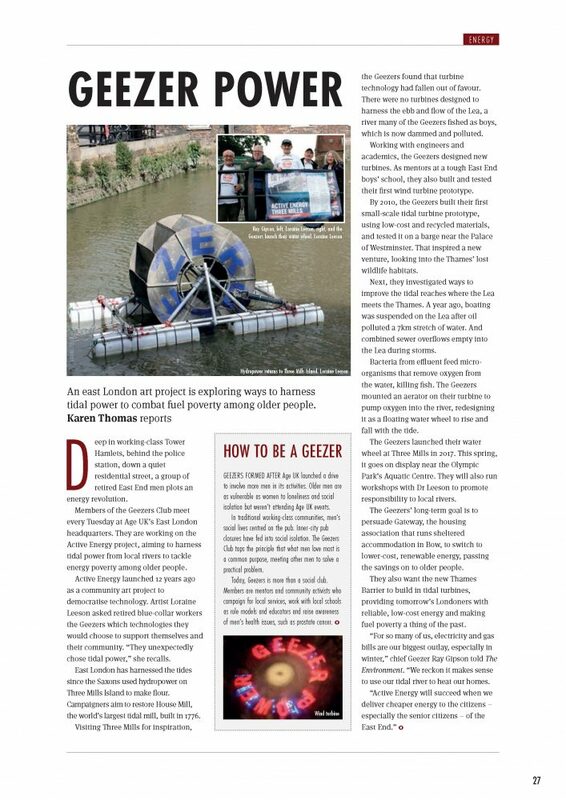 More recently, in 2010, the Geezers built a small tidal turbine and tested it on a barge at Westminster. The Geezers were thrilled when the latest issue of The Environment magazine featured their project. CIWEM (The Chartered Institution of Water and Environmental Management) is the leading royal chartered professional body dedicated to sustainable management of the environment, globally. They publish The Environment magazine. Next Tuesday some people from CIWEM are visiting the Geezers.